The Internet of Things Will Be the World’s Biggest Robot. Like many tech neologisms, I’ve often found “IOT” frustratingly vague. Schneier distills it down to its essence and paints a wonderful picture of how might apply to our lives in the very near future. I suggest not watching Ex Machina too soon after reading his post. The last time Northern Ireland qualified for a major football tournament, I looked like this. It was 1986. As I sat in Windsor Park’s Railway Stand, watching a warm up game for the Mexico World Cup, I had no idea that the green and white rosette I wore would fall out of fashion faster than my beloved team would tumble down the FIFA world rankings throughout the next 30 years. Since then, we’ve not come close. We’ve had to console ourselves with moral victories (one-off wins against England and Spain), whose points were ultimately worth nothing in our attempts to reach a World Cup or European Championships. Away trips have been more about seeing a new European city, having a laugh and being an ambassador of sorts, rather than footballing success. To date, I’ve only witnesed a single victory on foreign soil. These were games where even a single goal was something to be celebrated, regardless of the result. Even at home, a David Healy tap-in during a 4-1 defeat to Norway caused jubilation in the Kop stand – it was the first the team had scored in over 20 games. Our ability to get behind the team and with typical Northern Irish humility, expect so little, yet remain so hopeful, is what’s kept us going. That’s precisely what makes today seem so special, and so strange. At the end of an unnervingly consistent campaign, a win against Greece would send the Green and White Army to the European Championships for the first time in history. That wee boy from the ‘86 Railway Stand ended up straying a bit further from home than he’d ever intended. If anybody needs him this afternoon, he’ll be in The Local, hopefully celebrating. Now where in Minneapolis could I buy myself a new rosette? Perhaps it’s time they too made a comeback. 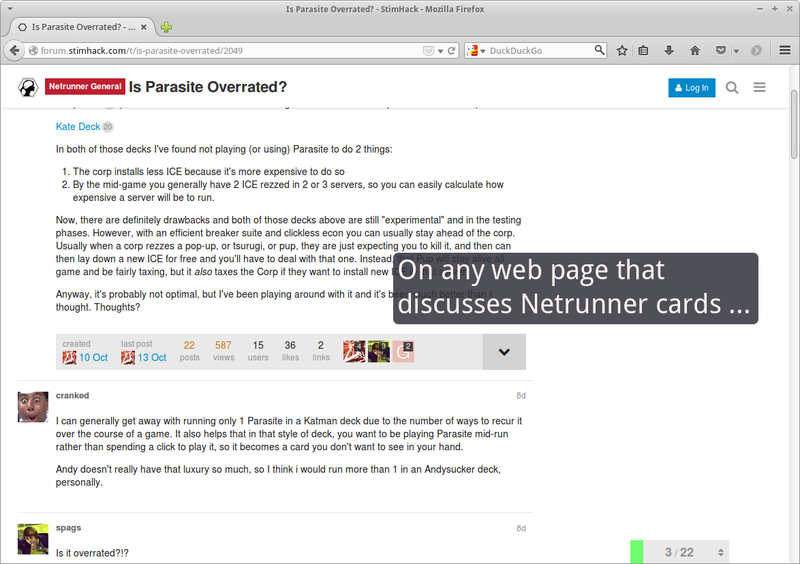 It’s an honour to feature on My Linux Rig this week. Steven does such a great job curating these interviews. His site appeals not only to the Linux geek in me, but also to the part that’s just fascinated by the idea of computers as customizable, essential tools for getting things done. As a kid, I grew up dreaming of some day playing football at Wembley. I didn’t want fame or fortune, I just wanted to strut my stuff on what I knew was the best surface available. Making do with cul-de-sacs, parks and church halls, my one school trip to Wembley didn’t put me anywhere near the hallowed turf itself. These days I have easy access to plastic pitches that young me would never have dreamed possible. My local New England Revolution produce an attractive, often successful style of passing football on FieldTurf. It’s time to destigmatize plastic pitches. And Barnes’ notes in particular are strangely, incredibly beautiful. Well worth a look. Dan Gillmor says he’s putting more trust in communities than corporations. If too few people are willing to try, though, the default will win. And the defaults are Apple, Google and Microsoft. I’ve been gradually moving away from Google in particular over the past year. My mail is now on Fastmail, my calendar on Outlook.com (I’m less convinced that Microsoft remain a “default”), whenever possible my OS is some flavour of Linux, and I love to build my own PCs. It’s not the easy path, but it’s definitely worthwile and rewarding. Proud of my new found status as the first to ever tweet the #gawa hashtag. Chess engines and databases weren’t around when I wrote that book (the same goes for the early editions of How to Reassess Your Chess), and I was using pen and paper, with a chess set on the table. As a result, the Amateur’s Mind was filled with errors. And, of course, once chess engines were a dime a dozen, the know-it-alls not only gleefully pointed this out, they claimed the book was terrible due to those mistakes. But, that’s completely wrong. The Amateur’s Mind is an exceptionally instructive book, and like all my work, it’s about concepts that will help most amateurs improve their chess understanding. That potentially destructive urge to be “right” above all else, recently reared its head when a now infamous Harvard professor chose to relentlessly bully a small Chinese restaurant over a billing error. … a psychologist at Central Michigan University, took a group of 117 students (about two-thirds female) and had them watch a short movie and write a review that they would then show to a partner. Gibson’s team told some of the reviewers to try to make their partner feel warmly toward them; others were told to try to appear smart. You guessed it: Those who were trying to seem brainy went significantly more negative than those trying to be endearing. Why does this bias exist? No one really knows, though some theorists speculate it’s evolutionary. In the ancestral environment, focusing on bad news helped you survive. So are all attempts to appear intelligent and nice doomed to failure? Against the odds, I’m determined to try! 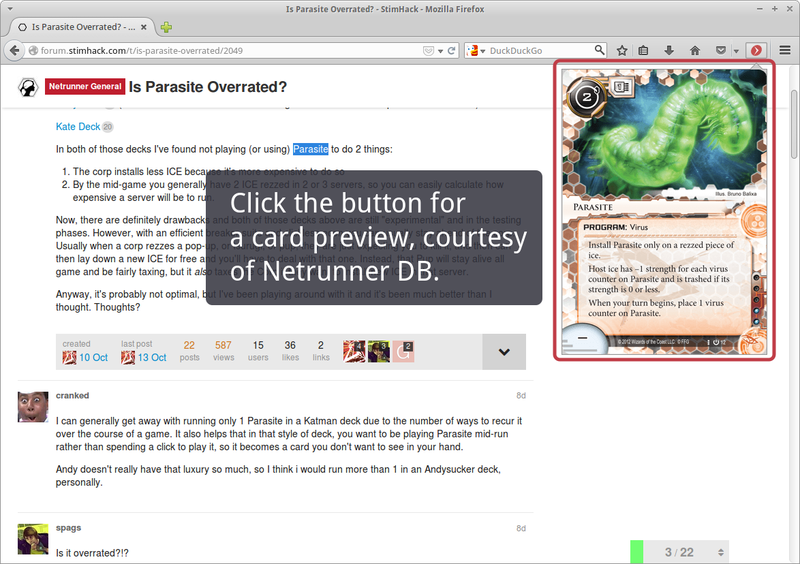 As a Netrunner fan and general efficiency geek, I’ve never been too happy with the workflow whenever I’m reading some Netrunner forum, see a card name, copy that text, paste it in to netrunnerdb.com, see the card in a new tab … you get the idea. 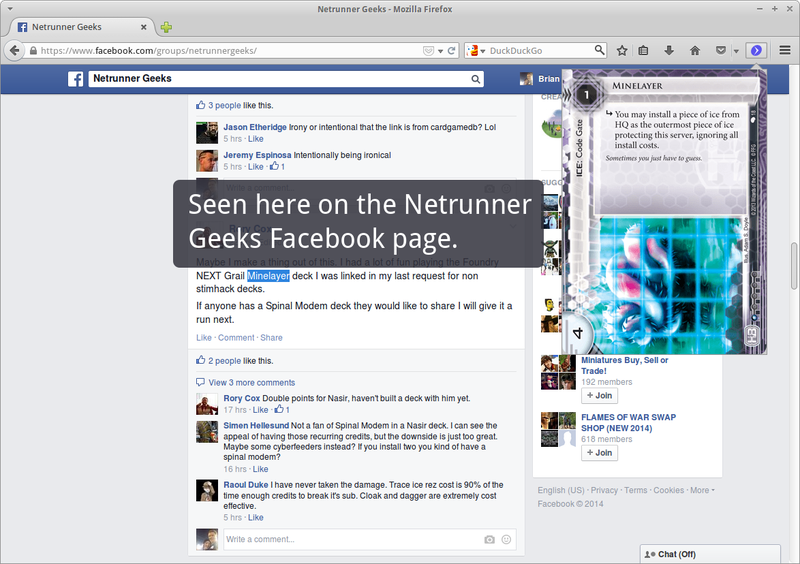 Special order is a Firefox Addon that aims to simplify the process. 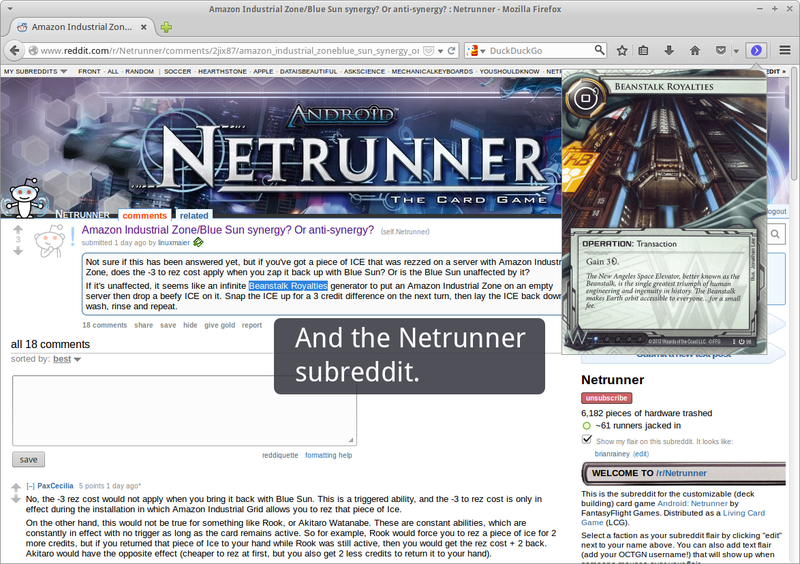 After installing, just highlight a card name on any web page, watch the toolbar icon light up (blue for Corp, red for Runner) then click the button to see the card. 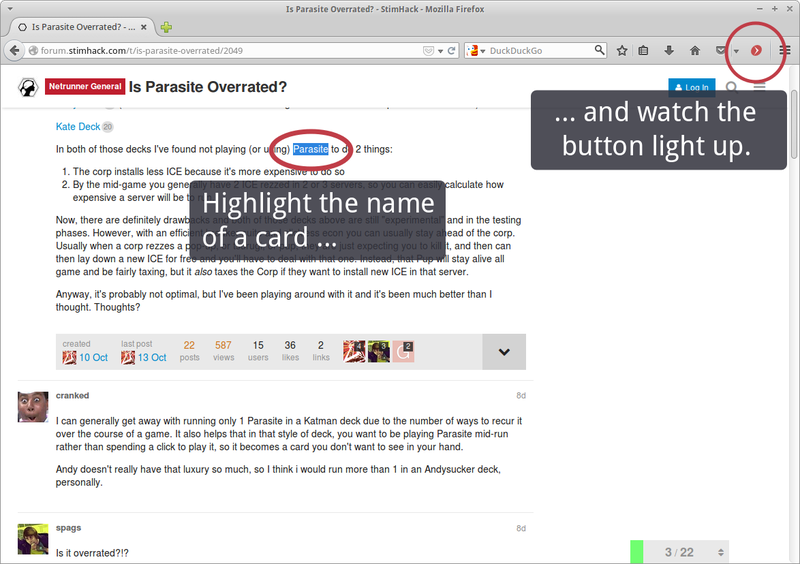 It’s an easy one-click install over at addons.mozilla.org. Version 1.0 includes support for common acronyms (APP > AstroScript Pilot Program), synonyms (Andy > Andromeda), misspellings (Quandry > Quandary) and depluralization (Plascretes > Plascrete Carapace). This is my mum’s “go to” cake. Easy and tasty. Have the butter soft; ideally left out overnight. Cream it together with the sugar then add the remaining ingredients and combine well without beating too much. Divide the mixture between 2 cake tins (8.5 x 8.5 or so). Bake in the oven at 180 ºC (350 fahrenheit) for approximately 25 minutes. Let the halves cool, then sandwich them together with jam (or fruit) and cream. I'm Brian Rainey. Born and bred in Norn Iron, I somewhere along the way fell for a girl and ended up in Apple Valley, Minnesota. I work at Oracle and think robots are cool.